The world's population has crossed 7 Arab in 2011 AD. In 1 AD, the total population of the world was 250 million, i.e. 25 crore only. The world population took about 1650 years to reach 50 crore. In 1820 AD, the population of the world reached 100 crore, i.e. 1 Arab. In 1930 and 1975 AD, the world’s population reached 3 Arab and 4 Arab respectively. The world’s population reached 5 Arab in 1987 AD. The population started to increase rapidly since the middle of 17th century. We can find that the population of Europe, Russia and America was increased rapidly before 1950 AD. This speed of population growth was found in China in about 1700 AD. Population expert Colin Clark expected that the world population would reach 3.5 Arab in 1900 AD. Next Population expert Notestine expected that the world population would reach 3.3 Arab in 2000 AD. But that expected population exceeded before 2000 AD. Similarly, the world’s population reached 6 Arab in 1999 AD. There was an increment of 1 Arab population in the world in a short duration of 12 years. The population started to increase rapidly since middle of 17th century. We can find that the population of Europe, Russia and America was increased rapidly before 1950 AD. What is population? Describe, in brief, the size of population and growth rate of the population? In a general sense, population refers to the total number of people living in a certain place over a certain time period. But the definition has become more comprehensive in the modern time. Now population refers to the 'cohort of an organized group of people'. This emphasizes the interrelationship of the members of a certain community. They share similar culture, social, economic as well as geographical backgrounds and maintain co-operation among themselves. 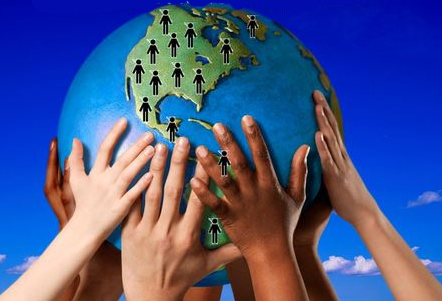 The total number of all individual units of peoples of a certain population is known as the size of the population. The size of the population is determined by three factors: birth, death and migration. Birth and immigration cause increase in the size while death and emigration cause decrease in the size of the population. Population growth rate is the rate at which the size of the population changes over a certain time period, mainly in a year's time. Thus, the changes in the size of population lead to the change in its growth rate. Write about the growth of population from the 17th century to 1999 AD. The world's population has crossed 7 Arab in ______. In 1 AD, the total population of the world was ______. The world’s population reached 5 Arab in ______. How many years did the world population take to reach 50 crore? What is the population growth rate of the world according to the census of 2011 AD? Any Questions on 'Population Growth Rate and World Population '?